The research laboratories from the University of Santiago de Compostela (USC) will host an ambitious project financed with a total of about half a million euros involving agencies from four different countries. The project goal is to revolutionize the field of porous materials with nanometric control. If porous materials in the nanometric scale could be seen, they would look something similar to a strainer or a butterfly-trap; but with a particular singularity, the empty tiny and regular empty spaces between the building blocks that constitute the three-dimensional lattice of the porous structure. These networks and nanometric cavities are molecular architectures with great utility in applications like the selective trapping, transformation, separation, and purification of the chemical compounds that can interact with the porous network. Such materials are nowadays being used in different industrial processes, as well as in the purification of drinking water, or in the synthesis of materials for the purification of relevant chemicals. So far, most of the porous materials are based on the aluminum and silicon networks or in metal atoms linked by organic molecules. In this context emerges ‘Supraporous’, a new translational research project lead by CiQUS researcher Javier Montenegro, a researcher at CIQUS. This project poses an alternative to the conventional strategies in the construction of porous materials by using nanoparticles linked by supramolecular polymers. The main objective is to construct new hybrid materials that allow to fill the existing gap between the small porous materials (which pore size have issues when used with medium size molecules) and the ones of bigger dimensions. The researches will apply for this purpose one of the most relevant polymerization methods nowadays, the living polymerization. With this method applied to supramolecular polymers, the length of the polymers can be controlled and thus the porous lattice formed by the metallic nanoparticles. On-demand control of the pore size is the principal advantage of the network constructed by living polymerization: a control mechanism by the combination of several metallic nanoparticle sizes with polymers of different length. On the other hand, the architecture of this new lattice will allow to merge the biocompatible properties of the supramolecular polymers (i.e. high-water solubility, chirality, or even therapeutic properties) and the inherent convenient optical properties of the metallic nanoparticles. The biocompatible nature of these new proposed materials will allow its application in different fields like tissue engineering or the controlled delivery of bioactive substances. The idea of the project Supraporous was originated after a postdoctoral internship of Dr. Julián Bergueiro at Tokyo University under the supervision of the prestigious Professor Takuzo Aida. «Julian’s internship and his initial impulse were the main driving force of this high-risk collaboration between our groups», remarks Javier Montenegro. 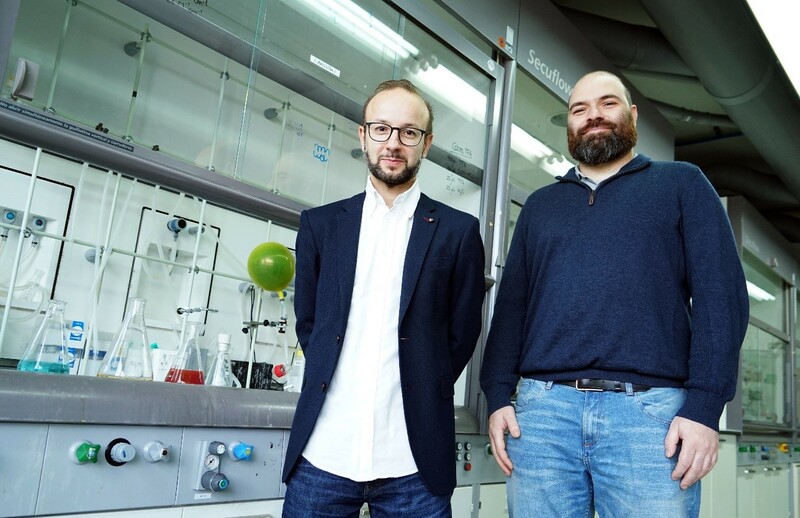 In words of CiQUS ERC Grantee, who will lead the project from CiQUS, «our idea was to state a revolutionary approximation towards new hybrid and porous materials, combining supramolecular polymers generated by both of the groups». After a preliminary discussion stage, the project team was complemented with one of the world leaders in nanobiotechnology, the named Professor Wolfgang Parak (Hamburg University, Germany) and Dr. Edvinas Orentas (Vilnius University, Lithuania), an expert in polymerization mechanisms and consultant of Ferentis, a leading biotechnology company. «All partners accept happily to join us in this high-risk project», maintains Julián Bergueiro. «The four involved groups gave a lot of input since the very beginning. All contributions and comments were considered to deal with the highest guarantee our objective in this call», comments the postdoctoral investigator. An ambitious objective, that intends to revolutionize the field of the porous materials with control in the nanoscale. Only five projects were granted in the 5th call of the EIG CONCERT program, an international joint initiative to support, coordinate, and enhance the cooperation in science, technology, and innovation (STI) between the European Union and Japan. A total of 43 proposals were evaluated, above the double than the last year’s call of this grant. The European Interest Group (EIG) CONCERT highlights that the growth in the number of proposals is a synthon of the program’s high dynamicity, as well as the high relevance of this call between the European and Japanese researchers.